Lattice Semiconductor and Affarii Technologies have demonstrated the industry’s lowest cost, low power Remote Radio Head (RRH) solution at 1300mW per antenna. The integration of all RRH processing has been achieved on a single LatticeECP3-150 device. using LDMOS and GaN transistors. All features of this RRH solution, both hardware and soft IP, are fully integrated and supported by Lattice’s latest generation of design tools. 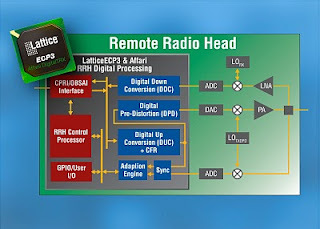 The RRH solution is built using Affarii’s digitalTRX technology that includes Digital Up/Down Converter (DUC/DDC), Crest Factor Reduction (CFR) and Digital Pre-Distortion (DPD) functionality. When used with industry standard Doherty amplifiers the Digital Pre- distortion solution provides up to 30dB of ACLR correction with PA output efficiencies exceeding 40%, allowing flexible and efficient RRH designs. The solution is fully customizable, with end applications including WCDMA, LTE, WiMAX, and DVB-T/S/H. The RRH solution is supported by a development and test environment that includes GUI-based design simulation, performance analysis and a production test API with design examples. Story from WSJ on the cancellation of pre-orders for Plastic Logic's Que reader, and no date for shipping - opps, not a good sign, and a real shame for a UK startup! Xilinx is tackling two of the key barriers to using FPGAs - power and cost. It is reducing the power consumption of its new 7 Series devices families by 50% over the previous generation and has developed an architecture that wil scale across three families, helping to reduce costs. However, the idea of heading into mobile equipment with some of these parts is somewhat optimisitic - low power serves more purpose in increasing channel density in networking and telecoms applications. “The 7 series represents a new juncture for Xilinx, and the FPGA industry in general, as we bring our technology portfolio to new markets by putting a significant emphasis on lowering power consumption,” said Xilinx President and CEO Moshe Gavrielov. “In addition to delivering what we and our customers expect from Moore’s Law in terms of capacity and performance with each new generation, we continue our focus on opening programmable logic to a broader audience by delivering design platforms targeted toward the specific needs of new users and markets.”The low static power comes from a HKMG (high-K metal gate) process optimized for low static power consumption (see “Xilinx Picks 28nm High-Performance, Low-Power Process to Accelerate Platforms for Driving the Programmable Imperative”) that lowers static power consumption by 50 percent compared to the alternative 28nm high-performance process. Xilinx then applied architectural enhancements to lower dynamic power consumption both for logic and I/O, while also introducing intelligent clock-gating technology with the release of ISE Design Suite 12. The result is an FPGA series that provides 50 percent lower total power consumption compared to Virtex-6 and Spartan-6 FPGAs and 30 percent lower than alternative 28nm FPGA device families. Designers can take full advantage of up to 4.7TMACS in DSP performance symmetric mode (2.37TMACs in non-symmetric mode) and 2 million logic cells at clock speeds of up to 600MHz, and achieve up to 2.4Tbps high-speed connectivity all while staying within their power budgets. All 7 series FPGAs share a unified architecture that enables customers to easily scale their designs up or down in capability to reduce cost and power or increase performance and capability, thereby reducing their investment in developing and deploying products across low-cost and high-performance families. The architecture is derived from the widely successful Virtex-series-based architecture and has been designed to simplify reuse of current Virtex-6 and Spartan-6 FPGA designs. It is also supported by the EasyPath FPGA cost reduction solution for the move to fixed silicon that further improves productivity by enabling a guaranteed 35 percent cost reduction with no incremental conversion or engineering investment. Customers who need the lower power or increased system performance and capacity provided in the new 7 series FPGAs can begin designs in Virtex-6 and Spartan-6 FPGAs and move the designs when the time is right through the adoption of the AMBA AXI interconnect standard enabling plug-and-play IP usage to help customers improve productivity and development costs. The devices use the same logic architecture, Block RAM, clocking technology, DSP slices, and SelectIO™ technology and build on previous generations of devices delivered by Xilinx’s patented Virtex series ASMBL block architecture. This next generation ASMBL architecture provides unprecedented flexibility and scalability that enables customers to most effectively use the full range of logic densities. Virtex-7 Family: 2X system performance improvement at 50 percent lower power compared to Virtex-6 devices, the ultra high-end Virtex-7 family sets new industry benchmarks with 1.8X greater signal processing performance, 1.6x greater I/O bandwidth, 2X greater memory bandwidth with 2133 Mbps memory interfacing performance, and delivers the industry’s largest density FPGA with 2 million logic cells, which is 2.5X greater density than any previous or existing FPGA. EasyPath-7 devices are also available for all Virtex-7 FPGAs for a guaranteed 35% cost reduction without requiring any design conversion. Virtex-7 devices enable 400G bridging and switch fabric wired communication systems that are at the heart of the global wired infrastructure, advance RADAR systems, and high-performance computer systems that require single-chip TeraMACC signal processing capabilities, as well as the logic density, performance, and I/O bandwidth required for next generation test and measurement equipment. The Virtex-7 family will include “XT” extended capability devices with as many as 80 transceivers supporting individual line rates up to 13.1Gbps and devices that provide up to 1.9Tbps serial bandwidth. Also, these devices offer up to 850 SelectIO pins enabling the industry’s greatest number of parallel banks of 72-bit DDR3 memory interfaces supporting 2133Mbps. Future devices will also feature 28Gbps transceivers. Kintex-7 Family: Establishing a new category of FPGAs, the Kintex-7 family delivers Virtex-6 family performance at less than half the price for a 2x price/performance improvement while consuming 50 percent less power. The family includes high-performance 10.3Gbps or lower-cost optimized 6.5Gbps serial connectivity, memory, and logic performance required for applications such as high volume 10G optical wired communication equipment. It also provides a balance of signal processing performance, power consumption, and cost to support the deployment of Long Term Evolution (LTE) wireless networks, meet the aggressive power and cost requirements required for next generation high definition 3D flat panel displays, and deliver the performance and bandwidth needed for next generation broadcast video-on-demand systems. Artix-7 Family: Delivering 50 percent lower power and 35 percent lower cost compared to the Spartan-6 family, the Artix-7 family uses small form-factor packaging and the unified Virtex-series based architecture to deliver the performance required to address cost-sensitive, high-volume markets previously served by ASSPs, ASICs, and low-cost FPGAs. This new family meets low power performance requirements of battery-powered portable ultrasound equipment, and addresses small form factor, low power requirements for commercial digital camera lens control, as well as the strict size, weight, power, and cost (SWAPc) requirements for military avionics and communications equipment. Early access ISE Design Suite software supporting 7 series FPGAs is now available. Initial devices will be available in Q1 of next year. 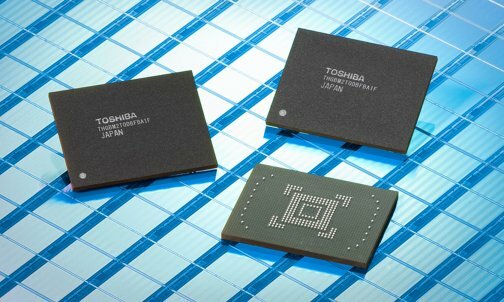 Toshiba has launched a 128-gigabyte (GB) embedded NAND flash memory module, the highest capacity yet achieved in the industry. The module is fully compliant with the latest e•MMC standard, and is designed for application in a wide range of digital consumer products, including smartphones, tablet PCs and digital video cameras. Samples will be available from September, and mass production will start in the fourth quarter (October to December) of 2010. The new 128GB embedded device integrates sixteen 64Gbit (equal to 8GB) NAND chips fabricated with Toshiba's cutting-edge 32nm process technology and a dedicated controller into a small package only 17 x 22 x 1.4mm. Toshiba is the first company to succeed in combining sixteen 64Gbit NAND chips, and applied advanced chip thinning and layering technologies to realize individual chips that are only 30 micrometers thick. Toshiba's modules now range from 2GB to 128GB and integrate a controller to manage basic control functions for NAND applications, and are compatible with the JEDEC e•MMC Version 4.4 and its features. New samples of 64GB chips will also be available from August. Demand continues to grow for large density chips that support high resolution video and deliver enhanced storage, particularly in the area of embedded memories with a controller function that minimizes development requirements and eases integration into system designs. 1. The JEDEC e•MMC V4.4 compliant interface handles essential functions, including writing block management, error correction and driver software. It simplifies system development, allowing manufacturers to minimize development costs and speed up time to market for new and upgraded products. 3. The 128GB device stacks sixteen 64Gbit chips fabricated with leading-edge 32nm process technology. Application of advanced chip thinning, layering and wire bonding technologies has allowed Toshiba to achieve individual chips only 30 micrometers thick, and to layer and bond them in a small package. The result is an embedded NAND flash memory module with the industry’s highest density. 4. The new products are sealed in a small FBGA package only 17 x 22 x 1.4mm and has a signal layout compliant with the JEDEC e•MMC V4.4. ARM, Freescale, IBM, Samsung, ST-Ericsson and Texas Instruments have created the not-for-profit company, Linaro, to provide new resources and industry alignment for open source software developers using Linux on the world’s most sophisticated semiconductor System-on-Chips (SoCs). Linaro’s base of software and tools will be applicable to a wide range of markets, helping reduce time-to-market for products such as smart phones, tablets, digital televisions, automotive entertainment and enterprise equipment. By providing the common foundations of tools and software for other distributions and stacks to build upon, Linaro enables greater operational efficiency for the electronics industry. Linaro’s first software and tools release is due out in November 2010, and will provide optimizations for the latest range of ARM Cortex-A family of processors. Traditionally, the Linux and open-source software communities focused on solving the software problems of enterprise and computing markets with a limited choice of processor platforms. The open source community is transitioning to create advanced Web-centric consumer devices using high profile open source based distributions and a wide range of high-performance, low-power ARM®-based SoCs. Linaro will make it easier and quicker to develop advanced products with these high profile distributions by creating software commonality across semiconductor SoCs, from multiple companies. In addition to providing a focal point for open source software developers, consumers will benefit by the formation of Linaro. Linaro’s outputs will accelerate the abundance of new consumer products that use Linux-based distributions such as Android, LiMo, MeeGo, Ubuntu and webOS in conjunction with advanced semiconductor SoCs to provide the new features consumers desire at the lowest possible power consumption. Linaro will work with the growing number of Linux distributions to create regular releases of optimized tools and foundation software that can be used widely by the industry, increasing compatibility across semiconductors from multiple suppliers. As a result, Linaro’s resources and open source solutions will allow device manufacturers to speed up development time, improve performance and reduce engineering time spent on non-differentiating, low-level software. Linux distributions, open source and proprietary software projects will benefit from Linaro's investment, with more stable code becoming widely available as a common base for innovation. Linaro engineers will contribute to a wide range of open source projects covering areas such as tools, kernel, graphics and boot code. Linaro intends to work in partnership with the Linux Foundation to align on core operating principles. In addition to ARM and IBM, four of the world’s leading application processor companies, Freescale, Samsung, ST-Ericsson and Texas Instruments, will align open source engineering efforts within Linaro. "IBM believes that leadership with Linux solutions begins with effective collaboration in the community, and IBM's ten year history of working with the Linux community has resulted in a strong, mutually beneficial relationship,” said Daniel Frye, vice president, open systems development, IBM. "IBM's ongoing collaboration has contributed to the widespread adoption of Linux throughout the data center. We are strong proponents of working with partners such as ARM to further our commitment, ensuring Embedded Linux is the leading platform for innovation in the mobile and consumer electronics markets." “Linaro is intently focused on delivering critical open source components to enable developers building on ARM-based processors. An important element of that delivery is a more complete, higher quality development toolset that increases performance. In our leadership role, TI will support Linaro’s efforts by leveraging our open source expertise—evidenced by our participation in Linux kernel enhancement submissions and our support of popular industry development boards,” said Remi El-Ouazzane, vice president and general manager, OMAP Platform Business Unit, TI. Mercury Computer Systems has started shipping the industry’s highest performance 6U module-based OpenVPX, dual GPU-based conduction-cooled subsystem, using whichever high power GPU is available. This subsystem is currently deployed in an embedded rugged defense surveillance platform, performing processing, exploitation, and dissemination (PED). One of the toughest challenges is to improve the military situational awareness through timely and precise delivery of actionable information by improved PED capabilities. Mercury’s subsystems are designed to provide these Embedded Smart Processing capabilities, enabling sensors to be smarter, able to accept unrelenting streams of data, and extract and deliver situational awareness and other crucial information. 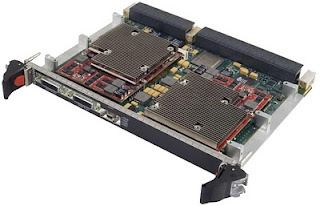 Mercury’s scalable ISR subsystem is powered by the Ensemble 6000 Series GSC6200 – an OpenVPX module powered by GPU technology working in conjunction with Intel-based processing in a conduction-cooled, 6U form factor. The subsystem currently delivers performance in the TeraFLOPS range, and the incorporation of GPUs enables the solution to be delivered in an optimized size, weight, and power (SWaP) footprint. Mercury’s innovative packaging technology on the GSC6200 leverages the easy-to-upgrade MxM GPU form factor, which enables customers to rapidly upgrade and deploy the latest and fastest GPUs from ATI or NVIDIA, resulting in even higher performance. “Our services and systems integration expertise allows us to offer our latest technology in a subsystem solution. This allows our customers to reduce their development risk while enabling concurrent engineering, ultimately leading to increased product velocity. Also, our approach of using standards-based, open APIs results in a subsystem which is open, a key requirement of our customers and as well as the U.S. Department of Defense,” said Steve Patterson, Vice President of Defense Product Line Management at Mercury. “Mercury’s new OpenVPX GSC6200 module leverages the best available technologies while providing a clear migration path for customers to implement emerging GPUs from either ATI or NVIDIA in the future. This enables our customers to offer best of breed solutions for the industry’s most demanding high-end signal and image processing applications,” he added. In addition to the GSC6200, other critical modules and services enabled the successful production of this subsystem. Mercury’s Services and Systems Integration team combined a multi-vendor hardware and software approach with their expert integration services to create the subsystem. The GSC6200 is providing industry-leading processing and exploitation capabilities to enable substantial SWaP improvements and parallel stream computing capabilities. It's always good to have pre-conceptions challenged, and this one is big - that HP is the leading manufacturer of Microelectromechanical (MEMS) sensors among semiconductor Integrated Device Manufacturers (IDM) and fabless firms, according to the latest figures from market researchers iSuppli. In second place and mirroring its runner-up position in 2008 was Texas Instruments. Likewise unchanged in their 2009 positions from the year before were the companies in third and fourth place: Bosch and Canon. Bosch, at No. 3, saw its overall MEMS revenue dip by 3 percent and its automotive MEMS revenue decline by 17 percent. However, consumer electronics revenue from the company’s Bosch Sensortec branch rose almost fourfold last year. Holding down the No. 4 spot was Canon, which gained MEMS share in the inkjet printhead segment, although its shipments remained flat. Other companies in the IDM and fabless category that performed well included Epson, which achieved a 12 percent increase in revenue thanks to its booming quartz MEMS gyroscope business; and STMicroelectronics, which holds more than 40 percent of the accelerometer market for cell phones. IDMs—i.e., semiconductor suppliers that conduct their manufacturing in-house—accounted for a greater share of MEMS revenue—roughly 77 percent, compared 23 percent for fabless manufacturers. However, the market share of fabless firms—i.e., semiconductor companies that outsource their manufacturing—is set to increase during the next five years because of the growing trend in the industry to use external foundries for semiconductor production. Taken together, MEMS revenue for the Top 10 IDMs and fabless manufacturers amounted to $5.7 billion in 2009, down 8.8 percent from the year before. The decline was less than expected, mainly because of the impressive recovery of sensor production, especially in the automotive sector, during the last four months of 2009. For more information, see iSuppli’s new report MEMS: Where's the Money and Who's Making it? In a bid to make wireless video work in the home, Broadcom has developed a single-chip 802.11n dual-band 3x3 wireless solution that achieves 450 Mbit/s data rates in client devices and over 600Mbit/s throughput (TCP/IP) in 3x3 AP/router configurations. By combining the MIMO wireless capacity with features to improve range, Broadcom's new Intensi-fi chip enables several wireless multimedia applications, including high-definition (HD) video streaming, back-up, storage, multiplayer gaming, audio streaming, wireless printing, and photo sharing. The BCM4331 802.11n solution delivers full 3x3 performance with three transmitting and three receiving streams of data in either the 2.4GHz or 5GHz frequency bands. An increased number of data streams and antennas results in faster speeds, longer range, fewer dropped connections, and better overall wireless coverage. The BCM4331 is now sampling and is being demonstrated at this week's 30th annual COMPUTEX in Taipei, Taiwan. A growing number of consumers want the ability to instantly access over-the-top (OTT) broadband video delivered through internet protocol (IP) directly to their TVs. ABI Research forecasts the connected TV market to exceed 117 million units by 2014. "The expanding use of video over Wi-Fi in game consoles, Blu-ray players, and TVs will impose new requirements for Wi-Fi access points," said Phil Solis, practice director for Wireless Connectivity at ABI Research. "3x3 Wi-Fi solutions provide the bandwidth and quality of service necessary to stream HD video reliably throughout an entire home, share media content with wireless enabled consumer electronics devices, and utilize Internet-based applications. This is important as consumers migrate to services that require their entertainment devices to be connected and to support their lifestyles wirelessly." With the Intensi-fi system-on-a-chip (SoC) solution HD video content can be downloaded to a notebook computer 50% percent faster than existing 802.11n 2x2 technologies. "We are driving the growth of the wireless market by introducing a solution that addresses the need for performance across multiple demanding applications," said Kevin Mukai, Senior Product Line Manager for Broadcom's WLAN line of business. "Broadcom's BCM4331 3x3 802.11n further enhances the overall user experience by providing substantially improved throughput and range. As a result, products using Broadcom's newest Intensi-fi solution will better address the growing consumer demand to share and distribute HD video content between multiple screens throughout the home, thereby improving the utility of every display device." A team of Duke University chemists has perfected a simple way to make tiny copper nanowires in quantity that are small enough to be transparent, making them ideal for thin-film solar cells, flat-screen TVs and computers, and flexible displays. “If we are going to have these ubiquitous electronics and solar cells,” Wiley said, “we need to use materials that are abundant in the earth’s crust and don’t take much energy to extract.” He points out that there are very few materials that are known to be both transparent and conductive, which is why ITO (indium tin oxide) is still being used despite its drawbacks, particularly being brittle. However, Wiley’s new work shows that copper, which is a thousand times more abundant than indium, can be used to make a film of nanowires that is both transparent and conductive. “The fact that copper nanowires are cheaper and work better makes them a very promising material to solve this problem,” Wiley said. Wiley and his students, PhD candidate Aaron Rathmell and undergraduate Stephen Bergin, grew the copper nanowires in a water-based solution. “By adding different chemicals to the solution, you can control the assembly of atoms into different nanostructures,” Wiley said. In this case, when the copper crystallizes, it first forms tiny “seeds,” and then a single nanowire sprouts from each seed. It’s a mechanism of crystal growth that has never been observed before. Wiley’s lab is also the first to demonstrate that copper nanowires perform well as a transparent conductor. He said the process will need to be scaled up for commercial use, and he’s got a couple of other problems to solve as well: preventing the nanowires from clumping, which reduces transparency, and preventing the copper from oxidizing, which decreases conductivity. Once the clumping problem has been worked out, Wiley believes the conductivity of the copper nanowires will match that of silver nanowires and ITO. “We think that using a material that is a hundred times cheaper will be even more attractive to venture capitalists, electronic companies and solar companies who all need these transparent electrodes,” he said. SGI has developed a breakthrough hybrid computing platform that will deliver a petaflop of performance within a single cabinet using technology from NVIDIA, ATI and Tilera. The platform uses an open software architecture and will scale from tens to hundreds of petaflops, enabling users to tackle the most demanding technical compute requirements. The new platform was designed to drive performance to specifically address the growing science and engineering technical markets that rely on high-end software to achieve rapid results. It offers GPU processing capabilities from NVIDIA and ATI, as well as accelerator-based technology from Tilera, and other peripheral component interconnect express (PCIe) based solutions. The technology will be seen in SGI products by the end of 2010.